On election day this November, ballot question 3 will ask Massachusetts voters whether to uphold the state law that protects transgender people from discrimination in public places, such as restaurants, shops, and hospitals. A “yes” vote would keep in place the current law, which prohibits discrimination on the basis of gender identity in places of public accommodation. To be successful, we must build awareness of the ballot measure in the LGBTQ community and with our allies. 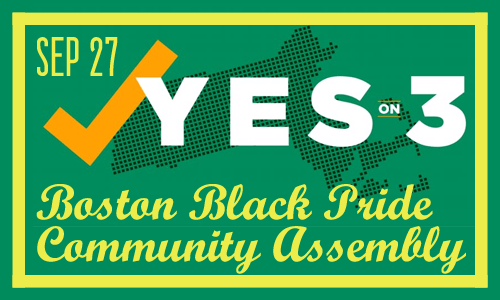 For this reason, Boston Black Pride and Freedom For All Massachusetts will be hosting a Community Assembly to bring together leaders from all Boston LGBTQ organizations to discuss communication strategies for strengthening our coalition of voters. During the assembly, speakers will provide an update on the campaign, discuss strategies for building awareness, getting out the vote, and opportunities for each organization to become more involved in the campaign. In addition to discussing strategies and advocating for everyone to vote, we have a special guest, keynote speaker Kryzia Salgado, on “Benefits From A Forgotten Art: Compassion.” We are excited to have this speaker come in and join us in support of the larger community. We hope you join us on this full and impactful evening filled with strategies and discussions, and ready to take on the ballot. Food and light refreshments will be provided for the evening. If you are interested in attending please RSVP here.